A powerhouse botanical blend that fortifies women’s natural rhythm. A comprehensive multi-nutrient and herbal formula for women’s strength, balance, and vitality.. 37 herbs, vitamins, minerals, and antioxidants designed to meet the nutritional requirements of women from menstruation to menopause. • Supports and regulates healthy menstrual cycles. • Supplies calcium and magnesium for bone strength. • High in vitamins essential for women’s overall health: A, C, D3, E, Thiamine (B1), Riboflavin (B2), Niacin (B3), Folate, B12, Biotin, and Pantothenic acid (B5). • Source of essential minerals zinc, selenium, and manganese. • Doctor formulated. Meticulously sourced. Third-party quality tested. 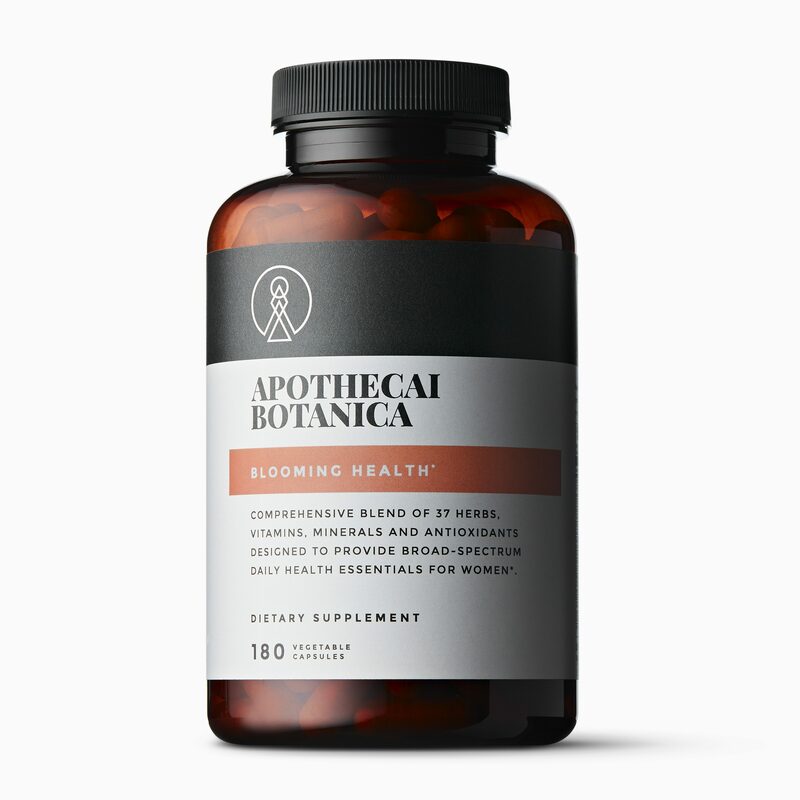 BLOOMING HEALTH fortifies a woman’s natural rhythms to support healthy periods, hormonal balance, and optimal reproductive health, as well as promoting cardiovascular health, metabolic function, and bone strength. Most of the steps we suggest for lifelong vitality are universal; everyone can benefit from sound sleep, cell health, and a clean diet. But women and men have different health needs: Bone strength, fertility, menstruation, and heart health are all areas where we encourage the women we work with to take proactive steps toward vitality. With these differences in mind, Blooming Health is tailored to women’s health needs. This dynamic formula delivers the benefits of a daily multivitamin with the addition of targeted ingredients formulated to advance long-term wellness, emotional support, and overall vitality. When it comes to detoxification, the liver is king, or, in this case, queen. Designed to break down and remove toxic matter from the bloodstream, the liver cleans the blood, metabolizes chemicals, and separates out nutrients we need for daily support and key functions. Traditional herbalists have turned to peony and burdock root for centuries to support liver health and promote gentle detoxification. * Choline, a water-soluble essential nutrient, is an overall vitality booster, especially in regards to liver health. These, together with the powerful amino acid L-taurine, which supports bile formation in the liver—the agent responsible for digesting fats—create a time-tested detoxification blend that nourishes the liver while helping it do its job. Suggested Use: As a dietary supplement, take 3 capsules 2 times daily, or as recommended by your healthcare practitioner. Vitamin A (as betatene, palmitate) 2500 IU; Vitamin C (as ascorbic acid, calcium ascorbate, magnesium ascorbate) 250 mg; Vitamin D3 (as cholecalciferol) 500 IU; Vitamin E (as D-alpha-tocopheryl acid succinate) 20 IU; Thiamine (as HCL) 20 mg; Riboflavin (as riboflavin 5′-phosphate) 10 mg; Niacin (as niacinamide) 62.5 mg; Vitamin B6 (as pyridoxine HCl, pyridoxal-5-phosphate) 21 mg; Folate (as folic acid ) 200 mcg; Vitamin B12 (as methylcobalamin) 25 mcg; Biotin 150 mcg; Pantothenic Acid (as di-calcium pantothenate) 20 mg; Calcium (as calcium carbonate, citrate, aspartate, ascorbate, di-calcium pantothenate) 109 mg; Iodine (as kelp powder) 125 mcg; Magnesium (as oxide, citrate, aspartate, ascorbate) 133 mg; Zinc (as citrate) 7.5 mg; Selenium (as selenomethionine) 100 mcg; Manganese (as sulfate) 1 mg. Healthy Hormones Blend 332.5 mg [(Ba Zhen Tang: DANG GUI (Angelica Sinensis)]; CHUAN XIONG (Szechuan Lovage Root); BAI SHAO (White Peony Root); SHU DI HUANG (Rehmannia); REN SHEN (Ginseng); BAI ZHU (Atractylodes Rhizome); FU LING (Poria); ZHI GAN CAO (Honey Fried Licorice Root), Alfalfa Leaf (Medicago sativa), Eleuthero Root (Eleutheroccus senticosus), Royal jelly, Ganonderma lucidum, Cordyceps sinensis, Schizophyllum commune, Chaste Tree Fruit Extract (Vitex agnus-castus), Blue Cohosh Root (Caulophylium thalictroides), Licorice Root Extract (Glyrrhiza glabra)]. Love Your Liver Blend 55 mg [(Chinese Peony Root Extract (Paeonia lactiflora)], Choline (as bitartrate), Burdock Root Extract (Arctium lappa), L-Taurine].